An awaited hello to the followers of thelittleshittyblog. Long time no see. Excuse my absence, blogging has been the last thing on mind recently. But now I am back and have a number of stories I want to blog about to make up for my disappearance. Also a warm welcome to my latest follower Michelle Kim. Please don’t be mistaken, this isn’t a post on my imaginary break up with my imaginary partner. This is just the spontaneous name I have given the next few blog posts which will be desperately trying to remind you all that I still exist and love you. – The other day, I was talking to a family member about the resilience of the young boys of the Satere-Mawe Tribe who live in the Amazon Rainforest. Yes it seems like a random topic to bring up with a family member, but I had recently watched a documentary on the subject and was so amazed by what I had witnessed that I just had to enlighten their minds. The coming of age Bullet Ant Gloves ceremony. The pain caused by this insect’s sting is purported to be greater than that of any other hymenopteran, and is ranked as the most painful according to the Schmidt sting pain index, given a “4+” rating, above the tarantula hawk wasp and, according to some victims, equal to being shot, hence the name of the insect. It is described as causing “waves of burning, throbbing, all-consuming pain that continues unabated for up to 24 hours”. So it’s worse than your local hornet. – for 10 whole minutes. And you would wear them for as many times as needed over many months till you no longer cried out in pain. That is what the children of the Satere-Mawe Tribe have to do in order to join the male hunters of the tribe. Now let me get one thing clear, these kids are willing to do this. They are not doing it unwillingly. I watched as, two young boys were about to go through the ceremony. One had never done it before and the other had experienced it already once before. The experienced boy was smiling confidently at the camera and when the other boy expressed his nervousness, the other said he would be there for him to help him through. They know what they’re going to do. So in preparation, the elders collect the ants and sedate them. 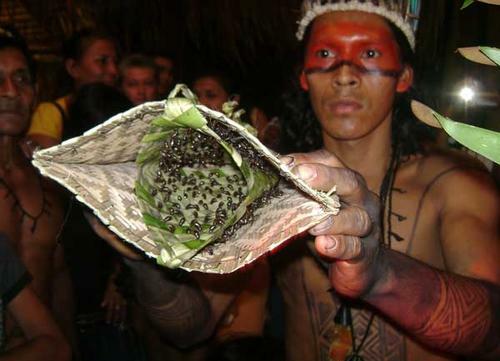 They then place them stinger first into gloves woven from leaves. Then as the drug wears off and the ants become agitated. That is when the gloves are placed on the children’s hands for 10 minutes. Afterwards they are forced to dance with the elders to help the venom flow through the body as staying still will not help them. After this, the boys get to talk with their leader, which is an honour saved only for those who are going/or have gone through the ceremony. They are congratulated and eat well. So these boys are tough. To compare, let me tell you about Hamish Blake, an Australian documentary filmmaker. In the last episode of the show Hamish and Andy’s Gap Year South America, Hamish decided to test his inner strength by going through this ritual. The grown man could only keep the gloves on for a few seconds before shaking them off. After his experience, he collapsed as a result of the pain and was taken to the nearest hospital. The pain lasted 8 hours. So these kids are stronger mentally and physically than the majority of adults in Western society never mind the children. As I discussed this topic with my family one thing became apparent. We are weak and too dependent. Most of us wouldn’t know how to function if the society we relied on crumbled around us. Survival skills aren’t taught in school here in the UK and I doubt they are in the majority of other Western schools elsewhere. Society could crumble a lot easier than we imagine. We wouldn’t need a zombie apocalypse. Things such as natural disasters, civil unrest, war, solar weather and the collapse of particular commerce (e.g. medicinal, food) between countries could all lead to the comfort of our lives being ripped away from us. I don’t want to be all gloom and doom but it really made me think. I needed to learn how to survive if I were lost in the woods where there’s no signal. I needed the tools to aid me in such times. I’d always been interested in the idea of taking part in survival classes. After realising my own vulnerability, I decided that putting off these ideas for a time when I needed them, would be too late. So I conducted a google search and although I have yet to find classes, I have begun to collect a number of items that will help me out if I ever need them. Here is the website I was looking through for ideas of what to get – Tactical Intelligence.net. So far I have purchased a bracelet made of rope from a local fair. It features a mini compass and a flint fire steel in the clasp. I have now learnt how to use a small compass and create fire with the flint, a cotton bud and vaseline. The latter was surprisingly satisfying as I had to figure out how to make the tinder more effective (I won’t spoil it for you) and also from the simple fact that without help from a lighter, I had used my own problem-solving skills and determination to create fire. I have also purchased two 12 hour glowsticks and a larger compass designed to be used easily with a map. I will continue to add to my growing collection. It’s actually quite addictive. So here ends my latest post in thelittleshittyblog. It’s a bit long, but I had a lot to say. I hope you enjoyed the read! Feel free to subscribe via email below so you don’t miss out on posts or follow using the RSS feed. Enter your email address to follow thelittleshittyblog and receive notifications of new posts by email. Splendid!